Some people are just too stupid to be entrusted with an e-mail account; Sherri Goforth is one of these people. Sherri Goforth is an aide to Tennessee Republican state Sen. Diane Black. 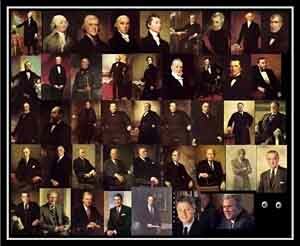 Yesterday she sent an e-mail to several colleagues with the above picture featuring all of our former presidents in “dignified and stately positions” — until it got to the last picture! Well, this IS Tennessee, after all! See the full story on Fox News and read a more amusing account in Neal Boortz’s blog. What amazes me is that Sherri Goforth still has a job. I wonder what she would have to do to get fired?